Intrigued by the search for intelligent life? No need for space travel—it’s happening right here on Earth, and the results are amazing. De Waal (Psychology/Emory Univ. ; The Bonobo and the Atheist: In Search of Humanism Among the Primates, 2013, etc. ), the director of the Living Links Center at the Yerkes National Primate Research Center, tells us that it takes human ingenuity and respect to comprehend the level of intelligence of an animal. In example after example, he entertainingly demonstrates how researchers with those qualities have revealed surprising things about animal cognition and the porousness of the wall between human and animal cognition. First, for the nonscientist, the author provides some background on scientific thinking about animal behavior, putting paid to the bygone notion that animals are simply stimulus-response mechanisms or are solely driven by genetically endowed instincts. In recent years, scientists have begun to recognize the many surprising abilities of animals. The author’s field is primate behavior, and most of the examples come from that field, but elephants, octopuses, squirrels, and magpies are among the many other animals to appear in these pages. He shows us many animals both in the wild and in captivity solving challenging problems, planning future actions, having better-than-human memories, making and handling tools, communicating, and demonstrating empathy and cooperation. 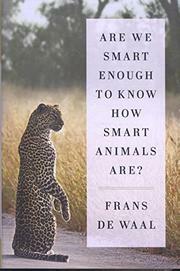 De Waal is persuasive in arguing that the difference between the cognition of the human and those of other animals is one of degree, not of kind, and the clarity of his writing makes for a highly readable book. A welcome bonus is the inclusion of rather charming, simple drawings by the author that give the essence of an activity better than a photograph might. For general readers, he includes a helpful glossary, and for those who want more details about the research cited, there is an extensive bibliography. After this edifying book, a trip to the zoo may never be the same.